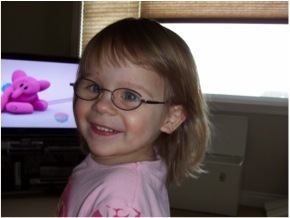 Kaylee, 2 years old – on her first day with glasses! She wears glasses for amblyopia, strabismus, and farsightedness, and will be patching 4 hrs / day. Glasses are Disney princess.